Equal Justice Under Law: Happy GSA Day! Today is National GSA Day! GSAs, or Gay Straight Alliances, can help make schools more welcoming, empowering and safer for LGBTQ students. 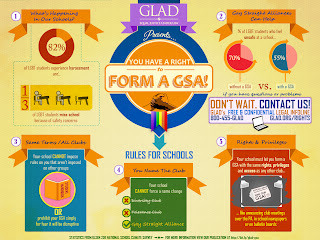 If you attend a school that receives federal funding - that's all public schools and even many private schools - you have a right to form a GSA if your school allows any extracurricular groups. Your school cannot treat your GSA any differently. This means you get the same rights, privileges and access as any other group or club. If you have questions about forming a GSA or encounter problems at your school, email GLAD's Legal InfoLine at www.glad.org/rights or call us at 800-455-GLAD. You can also read more about your rights in our publication The Right to Establish a GSA.